E-commerce is on the rise and the queues at cash-counters of super-markets are waning. Customers are getting accustomed to a wide variety of choices and “never-before” prices and discounts offered by a range of sellers selling goods online. The trends, fueled by the customer-experience parameter, are changing year after year. Keeping up with the changes and delivering on the customers’ expectations is not only desired but imperative. There are so many websites and so many products, ranging from cosmetics to industrial equipment, in the e-commerce arena that new entrants find a hard time in differentiating themselves from the rest; and the rest includes some of the fiercest competitors like Amazon. So why one should look forward to entering the e-commerce? 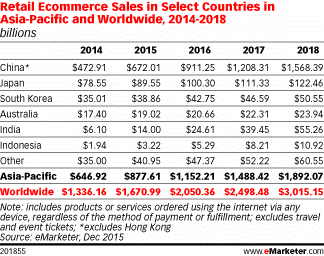 The graph suggests that e-commerce retail sales is on rise, and it is estimated to be $3000 billion worldwide by the year 2018. Opportunity awaits! What factors will give your e-commerce website an edge over others? Customers won’t mind privacy (until it is alarmingly intrusive) if they are getting a better shopping experience through product recommendations as per their browsing habits and easy checkout. The future of e-commerce entails advanced data mining techniques (Big Data) to ensure what exactly a returning visitor is looking for. Brick-and-mortar establishments have always been known for providing a more personal experience. How good it feels when the barista of the coffee house you frequent knows which coffee you’re likely to order in the morning as he starts preparing it without you needing to place an order! E-commerce is trying hard to emulate the same level of customer familiarity. In the online world, there are no smiling faces assisting a visitor in picking up her grocery, but the data can be leveraged here to compensate. If you’re new to e-commerce, customers may not feel the drive to order from your website. Your website needs to generate that interest. Pop-ups are back-in-business. Create compelling pop-ups offering discounts in exchange of user-registration. There could be other offers as well depending upon your business-type. Also, there are so many e-commerce websites that don’t take the advantage of chat modules to assist users in shopping. Live chat-support allows users to quickly raise queries and concerns and a timely response builds trust, which is exactly the element new entrants require. This can make or break your e-commerce start-up. Nobody likes the “waiting” period. The expectation bar has been raised by the mighty players offering same-day or one-day delivery. “If they can, why can’t you?,” a customer is likely to ask when a package take a bit more time in getting delivered. Get your logistics in order. Outsource it to a well-known company even if it leads to your customers paying for the shipping. This trend is enough to suggest that your e-commerce website has to be mobile-friendly. If the resources are available, you can develop native applications for major OS. Organic traffic continues to elude marketers worldwide. Google rankings are highly unpredictable, and hence you need to find other sources of traffic as well. Rope in content marketing. Create a customer focused blog that addresses the issues that users might face. Social media is another great medium to drive traffic. You may provide various incentives to your visitors for liking your FB page and following your brand on twitter. Design plays a significant role in customer engagement. Bigger images on the home page are best known for holding the interest of the visitor. How about some really innovative e-commerce website design ideas? Some of the new e-commerce websites look starkly different (for good) from the traditional layouts. Don’t fret over deviating from the standardized template. There is still a lot of user demand in the e-commerce sector, and the emerging players have the factor of flexibility that is working for them. The opportunities are many for the budding entrepreneurs and the right strategy will lead to a sustainable business in this crowded but unsaturated market.